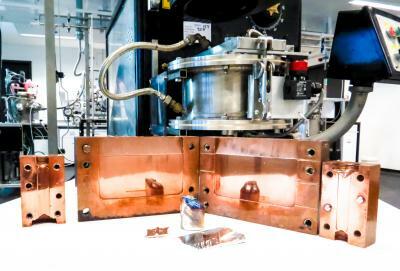 Shown are the castings of the bulk metallic glass (in front), the copper moulds and the induction furnace used to produce the material. Creating futuristic, next generation materials called ‘metallic glass‘ that are ultra-strong and ultra-flexible will become easier and cheaper, based on UNSW Australia research that can predict for the first time which combinations of metals will best form these useful materials. Just like something from science fiction – think of the Liquid-Metal Man robot assassin (T-1000) in the Terminator films – these materials behave more like glass or plastic than metal. While still being metals, they become as malleable as chewing gum when heated and can be easily moulded or blown like glass. They are also three times stronger and harder than ordinary metals, on average, and are among the toughest materials known. “They have been described as the most significant development in materials science since the discovery of plastics more than 50 years ago,” says study author, Dr Kevin Laws, from UNSW Australia in Sydney. Most metals are crystalline when solid, with their atoms arranged in a highly organised and regular manner. Metallic glass alloys, however, have a highly disordered structure, with the atoms arranged in a non-regular way. “There are many types of metallic glass, with the most popular ones based on zirconium, palladium, magnesium, titanium or copper. But until now, discovering alloy compositions that form these materials has required a lengthy process of trial and error in the laboratory,” says Dr Laws. In the new study, published in the journal Nature Communications, Dr Laws and his colleagues describe a unique new model of the atomic structure of metallic glass, which allows scientists to predict the metal combinations that will have glass-forming ability. They have used their model to successfully predict more than 200 new metallic glass alloys based on magnesium, silver, copper, zinc and titanium in the past few years. “With our new instruction manual we can start to create many new useful metallic glass-types and begin to understand the atomic fundamentals behind their exceptional properties. We will also be able to engineer these materials on an atomic scale so they have the specific properties we want,” says Dr Laws. “Metallic glass alloys are expensive to manufacture and to date have only been used in niche products, such as ejector pins for iPhones, watch springs for expensive hand-wound watches, trial medical implants, and tennis racquets and golf clubs. They are also planned for use in the next Mars rover vehicle. April 6, 2019 - Heraeus 3D prints largest ever metallic glass part 3DPMNMetal powder specialist Heraeus presented a world record additive manufactured gear wheel made of Heraeus metallic glass also known as amorphous metal. February 22, 2019 - Liquid has structure, which may be key to understanding metallic glass Yale NewsMetallic glass's unique properties lend it versatility and strength — but also hard to control. New Yale research offers some clues that may help change that. April 18, 2019 - Materion Corporation (NYSE:MTRN) Shorts Declined By 39.68% As Of Apr 18, 2019 K ReviewerBig Money Sentiment increased to 1.32 in 2018 Q4. It has change of 0.35, from 2018Q3's 0.97. The ratio is positive due to Materion Corporation positioning: 12.